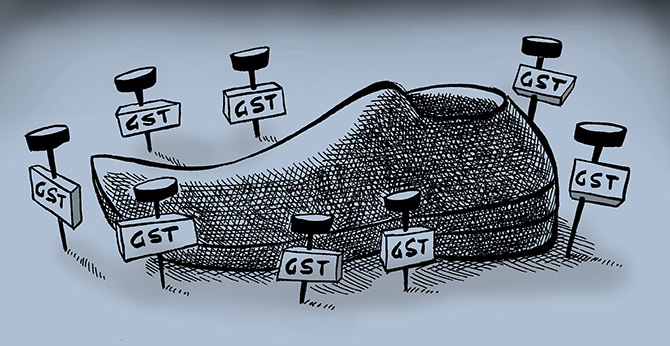 The government on Tuesday introduced four Bills in the Lok Sabha to amend the Goods and Services Tax (GST) laws, to provide for simplified returns and raise a threshold for the composition scheme under the indirect tax system. A draft framework for the simplified return was put in the public domain recently. Micro, small, and medium enterprises (MSMEs) that have annual turnaround of up to Rs 5 crore will be able to file quarterly returns once the Bills are passed. Also, those with annual turnover of up to Rs 1.5 crore will be allowed to opt for the composition scheme. Now, the threshold is Rs 1 crore. The scheme provides for a flat and concessional GST rate, but does not give input tax credit. The Bills are primarily aimed at helping the MSME sector and small traders, Finance Minister Piyush Goyal said while introducing these in the Lok Sabha. He said the simplified GST return forms - Sahaj and Sugam - will be introduced to bring about ease of doing business. The amendments will allow employers to claim input tax credit on facilities such as food, transport, and insurance provided to employees. It also provides for separate registration of companies having different business verticals, cancellation of registration, and issuance of consolidated debit or credit notes, covering multiple invoices. According to the amendments, e-commerce companies will not have to seek registration under the GST if their annual turnover is less than Rs 20 lakh. The Bill to amend the Compensation Act will enable the Centre and the states to distribute the unutilised compensation fund equally between themselves. Objecting to the introduction of the Bills as part of a second supplementary list of business on Tuesday, Congress member Sunil Jakhar said these have been “hurriedly brought” and would hurt the interest of the MSME sector. He also said Punjab was suffering on account of GST implementation and the Centre should have consulted stakeholders before amending the laws. Responding to Jakhar, Goyal said the government had held wide consultation with all stakeholders, including ones in Punjab, and the changes are intended to help the small traders.